by Jack Murnighan and Maura Kelly. I'm not sure why I'm getting Architectural Digest (I didn't order it! ), but I've received the last three issues in the mail. Mailbox Monday is a weekly meme that allows us to "show off" our new books. The brainchild of Marcia, who has set up various book blogs as well as a Mailbox Monday blog, this friendly meme has been "on tour" for the past few years. This month, Lori's Reading Corner is the host of Mailbox Monday. What new books did you find in your mailbox recently? Good looking mailbox! Mine was a bit more active this week as well. 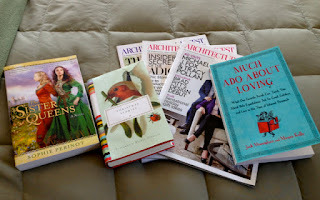 Enjoy your books and the Architectural Digest! That is funny about the Architectural Digest. Enjoy your books! We're getting a magazine we didn't order as well. Enjoy your new books! 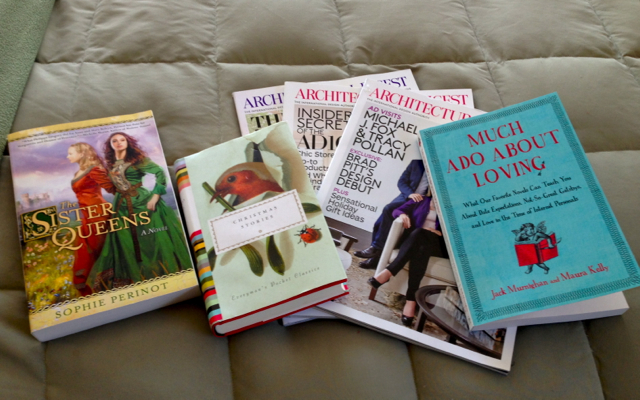 Your new books all sound interesting, even the Architectural Digest. Enjoy your new books. I got Much Ado About Loving as well, and am going to try to find the time to review it, even though I am more taken with audio right now. Excellent mailbox, Suko! I like what you've got there! Happy reading, Sister Queens sounds good. Enjoy the magazine too, maybe they are doing some kind of promotion. Maybe you'll end up liking the surprise magazine! Great mailbox! Enjoy your reading. That is too funny that you are getting a magazine u didn't order. My husband keeps getting "The Guide Post" - which we would never order -- think someone is playing a joke on him, or got to enter a buy 1 get 1 free subscription? Maybe the same is true for you? Enjoy your new books and magazines. These unsubscribed for magazines make you play a guessing game. Thanks for your comment, Diane! The title of Much Ado About Love caught my interest. Enjoy your stash! That is indeed a plentiful mailbox, happy reading. A few years ago my wife and I started getting unsolicited magazines like Men's Health and Fitness and Runner's World. At first we thought, "Hey, free magazines. That's cool.". But then we realized that the publishers had gotten ahold of our credit card and was already charging us for year-long subscriptions. Needless to say, we were on the war path in a hurry. I probably should make sure that I didn't (inadvertently) pay for a subscription to this magazine. Thanks for the comment! Nice collection to choose from! My mailbox has been quite sparse which is probably a very good thing as I am trying to read some of my long-held collection this year. Although I did recently receive a craft book that I'd forgotten I won in December -- a nice surprise and now I so wish I had even more time to myself as I want to experiment with some of the new fabric arts in it!